Councillor Davie Paterson outside the old Glenmac mill. A derelict Hawick mill’s use as a meeting place for youths has sparked growing fears that it is a potential deathtrap. The alarm was raised by Hawick and Hermitage councillor Davie Paterson after he witnessed several youths hanging around the old Glenmac mill site in Round Close on Saturday night. In response, Scottish Borders Council staff carried out a safety check and arranged for a local contractor to board up any entry points where youths are able to gain access. Mr Paterson said: “I was walking past the old Glenmac building with my dog when I heard banging and crashing and kids’ voices coming from the old factory. “I have emailed the police and asked the inspector to see if she could get some officers to please give this some attention. “I’m worried in case some child gets injured. “It could well be a deathtrap inside there now. “I am far from happy that there isn’t much that we can do to prevent youngsters going in and out of the building. “I am concerned that it will only be a matter of time before someone brings in some matches and it goes up in flames. A spokesperson for the council said: “We were notified on Monday of this week that people were entering the building. We visited that afternoon and noted the site fencing and gating were secure. “It appeared that those getting access were doing so by standing on a salt bin and pulling themselves up and over the high gate. 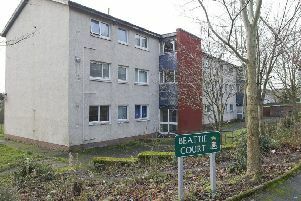 Hawick police sergeant Tom Quinn added: “Entering derelict and abandoned buildings, which may be structurally unstable or contain hazardous materials, is extremely dangerous. “With the summer holidays almost upon us, I would urge that all parents remind their children of the risk of entering these types of buildings. “Officers continue to patrol the hot-spot areas when resources permit and will act accordingly when reports of youths in derelict buildings are made. Back in 2002 conditional planning approval was granted to convert the building into a cinema and entertainment complex, but the application came to nothing. Three years later, a bid was made to demolish the ex-woollen mill and build flats on the site, but that application was later withdrawn too.